The attack on Union Agriculture Minister Sharad Pawar in Delhi on Thursday sparked protests in his home state Maharashtra and invited strong condemnation from political parties. 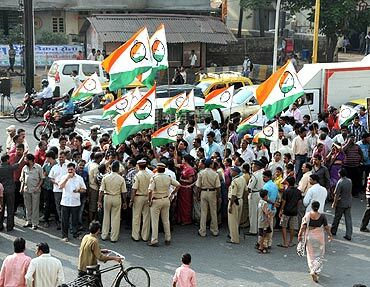 The Nationalist Congress Party has called a bandh in Pune, Sangli and Beed districts on Friday to protest the assault on its chief. "We have asked those who love Pawar saheb to observe the bandh. We won't compel anyone," Rajpal said. "The bandh will be peaceful," Pune city NCP chief Vandana Chavan said. Rasta roko protests were held in Solapur and Nashik to condemn the attack on Pawar, who was slapped by a youth at a public function, claiming he was angry with corruption and price rise. Senior Nationalist Congress Party Minister Laxman Dhoble led the rasta roko at Mohol in Solapur district. The protesters shouted slogans, condemning the attack. In adjoining Navi Mumbai, the agro produce market was closed in protest. In Baramati, Pawar's native place in Pune district, traders observed a spontaneous bandh. Maharashtra Bharatiya Janata Party president Sudhir Mungantiwar condemned the attack, describing it as cowardly. Leader of Opposition in Maharashtra Assembly Eknath Khadse said, "In a democracy, such attacks are condemnable. One can protest using non-violent means but such an attack cannot be justified." Home Minister and NCP leader R R Patil said Pawar's security needs to be stepped up in the aftermath of the incident. Pawar, 71, who went to attend a literary function at a public auditorium on Parliament Street, was slapped by Harvinder Singh, a transporter in his thirties who had also assaulted former telecom minister Sukhram outside a court on Saturday after he was sentenced in a corruption case. 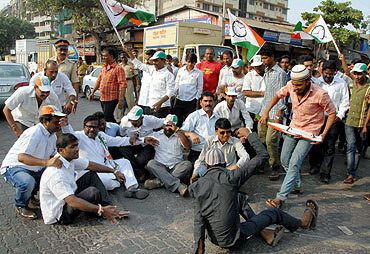 NCP workers also held protests at Mulund, Dadar and Worli areas of Mumbai. Some party workers were taken into custody in suburban Mulund for trying to disturb law and order, said a police official. Meanwhile, Maharashtra Chief Minister Prithviraj Chavan strongly condemned the attack on Pawar and said such incidents expose "lapses" in the security of senior leaders and ministers. "It has come to light that the same person had attacked former Union minister Sukhram a few days ago. The fact that such people can come close to senior political leaders and ministers is a cause of concern and indicates lapses in security," Chavan said. The Congress leader demanded a thorough probe into the incident. He said Pawar is not only a senior Union minister but also a national leader. "He should be provided adequate security and it should be ensured that such an incident does not happen again," he said. 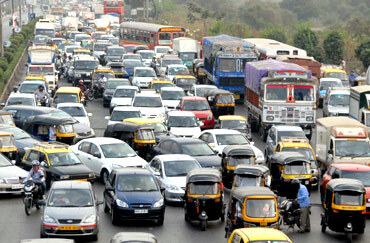 Protesters held demonstrations on roads in Mumbai, resulting in traffic snarls at several places. Suburban rail services were disrupted for a few minutes after NCP workers squatted on the tracks at Masjid Bunder and Kurla stations. They were quickly dispersed and train services were restored, said rail police. Road traffic was held up in various places like Mulund, Eastern Express Highway, Vikhroli, Mahim, Byculla and Saath Rasta, police said. NCP workers forced shop-owners to down their shutters in Sion, Dadar, Worli, Antop Hill, Shivaji Park and Kandivali areas. Mumbai police said several NCP workers were rounded up to control the situation. They were let go once the situation was under control. In adjoining Navi Mumbai, the agro produce market closed in protest. Home minister Patil has demanded that the Delhi police thoroughly probe the incident and identify the "real culprits". He also sought adequate security for his party president. Senior NCP leader and PWD Minister Chhagan Bhujbal strongly condemned the incident and said Pawar alone was not responsible for price rise. "I have requested him to enhance his security," he said. Minister of State for Housing Sachin Ahir said NCP workers should protest peacefully. "Nobody should take law into their hands and cause trouble to the common man." Ahir said both Deputy Chief Minister Ajit Pawar and State NCP president Madhukar Pichad have asked party workers to exercise restrain during protests. Mumbai NCP chief Narendra Varma said Pawar has told the state leadership that he was fine and asked them to ensure that there are no untoward incidents.